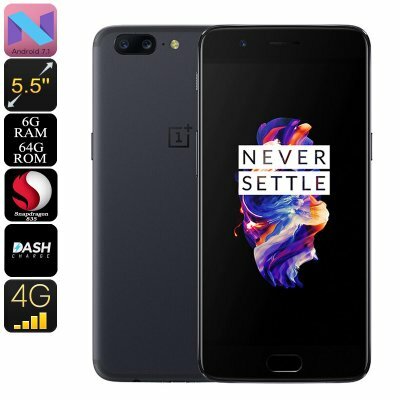 Successfully Added OnePlus 5 Android Phone - Snapdragon 835 CPU, 6GB RAM, Android 7.1, Bluetooth 5.0, 20MP Dual-Rear Cam, 4G (Gray) to your Shopping Cart. Say hello to China’s latest Android phone, the OnePlus 5. This flagship device certainly is the most anticipated Chinese Android smartphone of 2017. OnePlus is famous for producing high-end devices that come packed with the latest hardware available. With their latest smartphone, they have once again blown the minds of the global cell phone industry. Within its ultra-sleek body, this Android phone packs the Snapdragon 835 processor. This Octa-Core chipset has been clocked at a stunning 2.45GHz. It brings along an exceptionally powerful yet energy efficient performance. Along with the Phone’s 6GB of RAM, it lets you tackle the most demanding software features available. No matter what you throw at this Android phone, it is sure to meet your demands. With its Bluetooth 5.0 support, the OnePlus 5 allows you to transfer data between different devices in a blink of an eye. To browse the web, it supports 4G connectivity as well as Dual-Band WiFi. This means that you’ll always be able to stay connected to friends and family no matter where you’re at. Additionally, you’ll be treated to Dual-IMEI numbers. This makes your Android phone perfect for those of you that wish to separate work and private life while using merely one device. Its whopping 3300mAh battery brings along enough juice to get you through the longest of days. Thanks to this, you can leave your home with confidence and never have to worry about running out of juice again. On its stunning 5.5-Inch AMOLED display, the OnePlus 5 brings forth breathtaking visuals. You’ll be able to enjoy all your media in crisp 1080p resolution. It has furthermore been equipped with Corning Gorilla Glass 5. Thanks to this, you’ll never have to worry again about accidentally scratching or breaking your screen. This display will offer you a perfect platform from which to enjoy the pictures snapped with its intergraded cameras. The 16MP snapper at the front is great for shooting selfies or Full-HD video while its 20MP Dual-Rear cam lets you shoot stunning photographs and 4K video. The next time you head out with your friends or family, you can be assured that not a single moment will stay uncaptured. The OnePlus 5 Smartphone comes with a 12 months warranty, brought to you by the leader in electronic devices as well as wholesale electronic gadgets..
Arabic: - الروبوت الذكي - Chinese Simplified: - Android 智能手机 - Czech: - Smartphone se systémem Android - Danish: - Android Smartphone - Dutch: - Android-Smartphone - French: - Smartphone Android - German: - Android Smartphone - Hebrew: - הטלפון החכם אנדרואיד - Hindi: - एंड्रॉयड स्मार्टफोन - Italian: - Smartphone Android - Japanese: - Android スマート フォン - Korean: - 안 드 로이드 스마트폰 - Malay: - PINTAR telefon Android - Norwegian Bokmål: - Android Smartphone - Romanian: - Un Smartphone Android - Russian: - Android смартфон - Spanish: - Smartphone Android - Thai: - สมาร์ทโฟน android - Turkish: - Android Smartphone - Vietnamese: - Điện thoại thông minh Android376K.